Soon after her son was diagnosed with a brain cancer called anaplastic ependymoma, Lisa DeYoung was scanning through a brain tumor foundation website and stumbled upon Chemo Duck. She had no idea that Chemo Duck existed and is so glad she purchased one for her then 3 year old son. The comfort and connection Chemo Duck brought to Jack was enormous, she said. 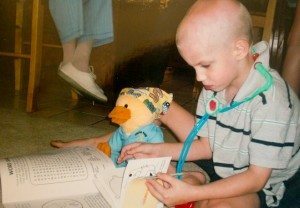 Athough Jack, now 8 years old, is no longer in treatment, Chemo Duck is still close by. The bright yellow stuffed animal not only served as an educational tool during his treatments, but became so much more. Each duck comes outfitted with a catheter sewn into its chest to resemble the line that is central to a chemotherapy patient’s treatment. Jack’s Chemo Duck has an additional resemblance – an incision to match that of his owner. For the DeYoungs, it helped their son to be able to interact with something that was very similar to himself.